All condensed phases (solids and liquids) have interfaces where they are in contact with other phases. Materials such as ceramics, metals and rocks comprise a multitude of grains of a single phase or of several different phases that are connected through a three-dimensional network of interfaces. Although the interfaces usually occupy only a negligible fraction of the overall volume, they control many of the material’s physical properties such as mechanical strength, toughness, electrical conductivity, magnetic susceptibility, effective diffusivities, corrosion resistance and many more. We refer to an aggregate of crystals of a single phase as a ‘polycrystal’. A composite material that is composed of grains of different phases is referred to as a ‘polyphase aggregate’. An interface, where two crystals of the same phase that only differ in their lattice orientations are in contact, is referred to as a ‘grain boundary’. An interface, where two different phases meet, constitutes a ‘phase boundary’. Solid–liquid, solid–vapour and liquid–vapour interfaces as well as interfaces between two different solids are phase boundaries. The topology and geometry of the grain- and phase-boundary network is controlled by a compromise between micro-structural equilibrium and space filling. Furthermore, the network of interfaces may evolve, e.g. under elevated temperatures. In the absence of mineral reactions and deformation, this evolution is driven by the reduction of the free energy associated with interfaces. Both grain and phase boundaries are essentially two-dimensional objects. For example, the generally employed formulation of the diffusion equation that approximates diffusion along an interface involves two spatial coordinates. The third dimension, which is perpendicular to the interface, is represented by a small characteristic width, which may be only a few inter-atomic distances. The effective diffusion coefficient that enters into the surface diffusion equation depends on the width of the surface. The microstructures and textures observed in rocks exhibit an overwhelming diversity (Vernon, 2004). They bear important information on rock formation and have significant control over bulk-rock properties and behaviour. Interfaces are the locations where both reactions and chemical mass transfer take place, and they are thus central in mediating mineral reactions, rock alteration and deformation.Furthermore, epitaxial and topotaxial orientation relations are established at interfaces (see Habler and Griffths, 2017, this volume). In this chapter we introduce the phenomenological treatment of interfaces. The concepts of interfacial energy and surface tension are discussed and conditions for micro-structural equilibrium are derived. Thereafter, capillary force driven interface motions including coarsening and grain-growth are addressed. We investigate thermodynamic equilibrium at curved interfaces and its implication for the evolution of heterogeneous systems. Finally, we treat some specific properties and the motion of interfaces in crystalline materials. 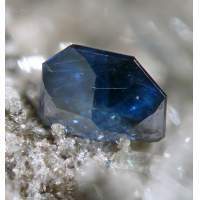 Although most of the considerations made in this chapter are of a general nature, the applications we have in mind are related to minerals and rocks.